Product prices and availability are accurate as of 2019-04-23 04:00:46 UTC and are subject to change. Any price and availability information displayed on http://www.amazon.com/ at the time of purchase will apply to the purchase of this product. The excitement of metamorphosis as you watch it change shape everyday. Kit includes: Nutri-Rocks, Vitamin-rich growth food, Fun 'n' Fact Handbook, Coupon for one Plex-Aquarium and one Grow-A-Frog tadpole. IMPORTANT: Aquarium and Tadpole are sent separately from manufacturer once you redeem your code. Unique clear-skinned tadpoles allow students to watch the growth of the tadpole into a frog inside as well as outside. NOTE: Kit includes a coupon code. 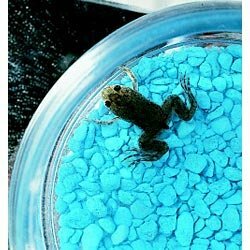 Once redeemed, the manufacturer will ship BOTH the aquarium and tadpole directly to you. Alert: CHOKING HAZARD-Small parts. Not for children under 3 years old.